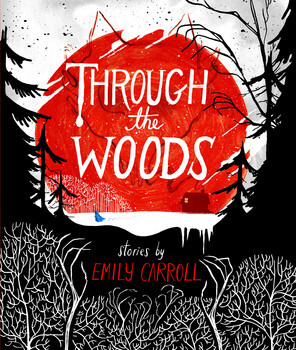 A Review of Emily Carroll’s “Through The Woods” (Margaret K. McElderry Books, Toronto). “Through the Woods” is a modern day Grimm’s collection of horror tales, and it is wonderfully grim. Beautifully illustrated in an iconic fairy tale style, Through the Woods creates a sense of discomfort about the environments that we generally consider safe. From tales of sisters being led out of their home by a deadly stranger, to a wife moving into her husband’s home to discover pieces of his former wife spread throughout the home, to a tale of brother killing brother, to a best friend possessed, to family members filled with horrors, . The invasions in this book are bodily, spiritual, and violations of homes. The type of darkness the tales evoke is one that is close to home. The graphic medium of these stories provides texture to them, a sense of closeness that makes the threat feel all the more real. Emily Carroll illustrates Through the Woods with a smoky quality that lets her stories bleed from the world of dreams into the mists that dwell at the edges of our vision. Words blur across the page, not generally confined to simple word bubbles or simple narration boxes, which are too confining for her style, but rather smeared across the page in a way that makes them part of pushing the action of the story forward. In some cases, dialogue is veiled in blood, part of a streak across multiple panels, tying the narrative together and breaking the simple borders of panels. There is a haunting, ethereal quality to these images which evokes the idea presented in the tales that horror lurks around us, insubstantial, but still hyper-present. To discover more about the work of Emily Carroll, visit her website at http://www.emcarroll.com/ . To find out more about Through the Woods, visit Simon and Schuster Canada’s website at http://books.simonandschuster.ca/Through-the-Woods/Emily-Carroll/9781442465954 . This entry was posted in Fiction Book Reviews and tagged Emily Carroll, family, graphic novel, graphic novel reviews, home, horror, horror comics, unfamiliar.